What is SAP Crystal Server? 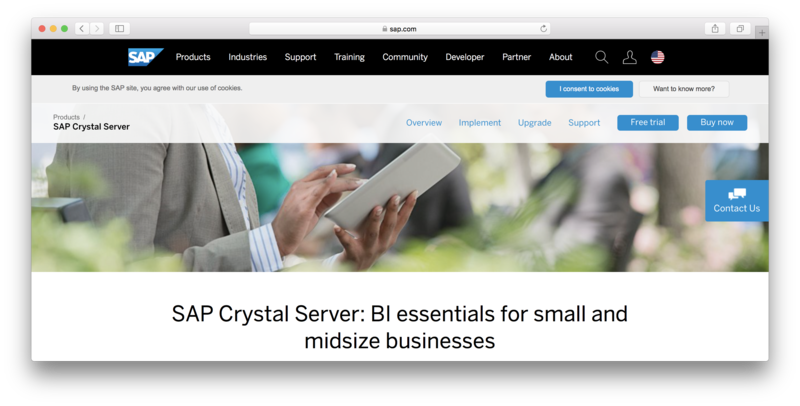 "SAP Crystal Server is a self-service Business Intelligence tool." This is very useful BI software for small business, that provides reports, dashboards, and data exploration within managed infrastructure. The main purpose of SAP Crystal Server is to ease the strain on IT resources and put business analytics directly into the hands the management. The vendor’s value proposition is that this software enables business users of all levels to make informed decisions and helps IT reduce reporting backlogs, administrative complexity, and costs. This business analytics solution closes the gap between transactions, data preparation, analysis, and action, so business owners can make more informed decisions. SAP Crystal Server scored 94/100 (No. 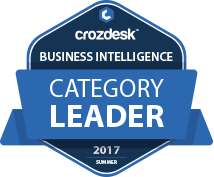 1 in Business Intelligence (BI)) in the Business Intelligence (BI) category. This is based on user satisfaction (80/100), press buzz (63/100), recent user trends (rising), and other relevant information on SAP Crystal Server gathered from around the web. The score for this service has declined over the past month. What is this? SAP Crystal Server is a core business intelligence (BI) software solution designed for small- to medium-sized enterprises (SMEs). It provides relevant reports, dashboards and in-depth data exploration within a safe and secure platform. It delivers easy-to-use, self-service business intelligence along with its core essentials directly into the hands of decision makers and company leaders across different industries. SAP Crystal Server, at its most basic, enhances the way people share and consume business data, reports and dashboards within the company setting. SAP Crystal Server core BI solution works by placing all relevant data directly into the hands of individuals within the company who are responsible for steering the ship in the right direction, so to speak. It aims to minimize the burden placed on IT resources as far as data gathering and analytics are concerned. This solution comes with features that allow you to access and share reports from a single platform, view dashboards and find crucial insights across multiple data sources, perform intuitive data exploration, ensure easy and convenient access to relevant corporate data and share customized reports to stakeholders and other decision makers. SAP Crystal Server is categorized as a business intelligence software solution. As such, it features a set of affordable BI tools such as dashboards, reporting via SAP Crystal Reports, data exploration and small business analytics. All these are built around an organized and securely managed infrastructure. SAP Crystal Server is packed with great affordable features beneficial to a lot of entrepreneurs, small business owners, company leaders and decision makers. Besides its affordable pricing, its robust infrastructure or the fact that the software solution is backed by a well-established industry leader, the solution also has impressive capabilities in both functional and technical aspects. The software solution allows you to improve performance with crucial BI content. With its features, performing root-cause analysis is possible, as well as monitoring real-time business performance and information gathering—anytime, anywhere. SAP Crystal Server offers the following capabilities. Minimize company expenses by deploying a single business intelligence server for dashboards and reports. Find relevant data quickly and easily by doing basic keyword searches from any information resource. Make data consumption, information sharing and reporting easier and more convenient for all users in your company. Easily integrate reports with other commonly used applications like Microsoft Office, Microsoft SharePoint and Java Portal Access. With this BI solution, you may also effectively share critical information across your company, giving teams, leaders and decision makers everything they need to choose strategies and make the right moves. Create and share customized reports to different individuals within your company, with every report personalized for each recipient. Create reports designed to publish automatically at specific times or during specific events or actions. Schedule reports efficiently and publish them using formats that are familiar to users and the application they’re using, which includes PDF, RTF and XLS formats. Give decision makers, stakeholders and members of your team easy and secure access to valuable information, whether online, offline or through mobile apps. In addition to the functional capabilities available with SAP Crystal Server, there are technical advantages you can gain from it as well, such as existing software integration. By having the ability to integrate with existing software, you can effectively adjust your company’s current IT infrastructure and save money without compromising the user’s ability to access pertinent data. If you have an existing reporting service like Microsoft Reporting, you can easily integrate it with SAP Crystal Server. You can embed critical corporate data within Microsoft Office without having to worry about accuracy or data loss. SAP Crystal Server can be easily integrated with existing custom-built applications that you may be using in your company. Publishing or sharing reports is also possible using other applications like Microsoft SharePoint and Java Portals. Aside from integrating with other existing software applications, SAP Crystal Server also allows companies to mobilize valuable business analytics by taking advantage of the mobile solutions add-ons. Deliver useful analytics and other data to your company’s frontline workforce by using SAP Crystal Server’s add-on for mobile solutions. Disseminate crucial information, SAP Crystal Reports and data exploration files through your mobile services. Save cost by not relying too much on your IT to provide easy, safe and secure mobile access to self-service business intelligence reports. Take advantage of a mobile BI service specifically designed and priced for departments and small- to mid-sized businesses. SAP Crystal Server is an on-premise BI solution with a mobile solutions add-on. It is purchasable with a Concurrent Access License (CAL) or a Named User License (NUL). CALs are most suitable for casual reporting users, while NULs are best suited for users who need guaranteed access to all software features like dashboards, reports, BI workspaces and data exploration. You may visit the vendor’s official website or contact them directly for additional information about the pricing and to get a quote. Is the software solution worth it? SAP Crystal Server is a core BI solution that allows self-service access to valuable information via reports, dashboards and data exploration. It is relatively easy to deploy, integrates well with existing applications and competitively priced. It’s a great business intelligence solution for businesses of any size or industry. Product recommendations, vendor rankings, market overview and tips on how to select Business Intelligence (BI) software for business. Published in April 2019. What platforms does SAP Crystal Server support? SAP Crystal Server supports both Windows and Linux. What are some applications SAP Crystal Server is commonly used in tandem with? It is commonly used in tandem with Microsoft Office and Microsoft Share Point. Who are the main user groups of SAP Crystal Server? The main user groups of SAP Crystal Server include both small and medium businesses. Does SAP Crystal Server offer an API? Yes, SAP Crystal Server offers a complete set of APIs in both Java and NET. What is SAP Crystal Server generally used for? This service is used as entry-level secure business intelligence (BI) solution. Does SAP Crystal Server integrate with any other apps? Yes, SAP Crystal Server integrates with Java Portal Access, Microsoft Office, and Microsoft SharePoint. Does SAP Crystal Server offer guides, tutorials and or customer support? Yes, customer support is available through email, live chat, videos, tutorial, and phone calls.